Small differences on a Buffalo (or Indian Head) nickel can make a big difference in the value. There are several valuable Buffalo nickel key dates and varieties that every coin collector should be aware of. Study the descriptions and photographs of each coin and you will be able to identify these coins that you may have in your collection. Many factors go into determining the value of a coin, and the value of Buffalo nickels are no exception. In 1913 the U.S. Mint retired the Liberty Head nickel (or "V" nickel) design and started making the Buffalo nickel. It is also commonly known as the Indian Head nickel. When the design first came out, the buffalo on the reverse was standing on a mound of dirt. The raised letters specifying the denomination of "FIVE CENTS" wore away prematurely. 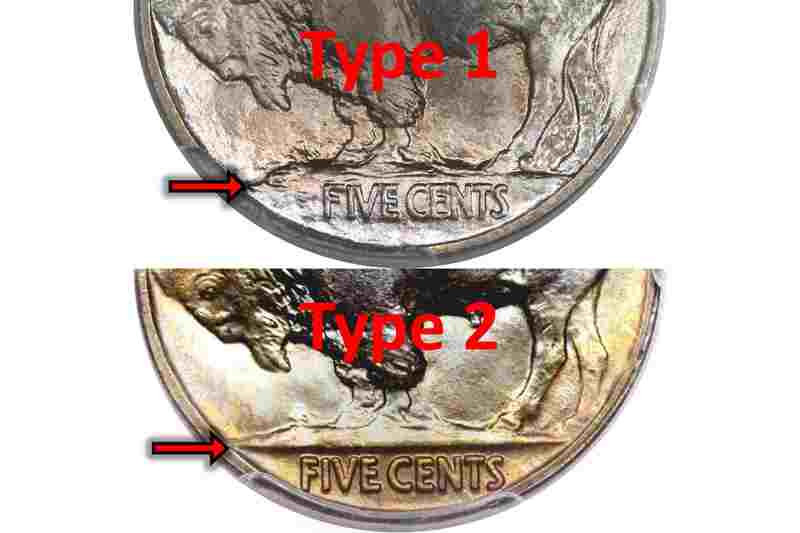 To solve this design problem, the mint recessed the denomination so the rim and a line of dirt below the buffalo would protect the inscription of the denomination. All three mints produced both varieties of these coins, but the San Francisco issue with the "S" mint mark on the reverse is the rarest. In 1916 a production mistake yielded a dramatic doubled die on the obverse of the coin. Look for doubling in the last three digits of the date. You will notice that the duplicate digits are a little to the right and lower than the more pronounced date of 1916. This die variety is the most sought-after of all the Buffalo nickel varieties. It is very valuable in circulated grades and very rare in uncirculated grades. At the Denver mint facility in 1918, another production mistake yielded a spectacular doubled die variety on the obverse. Although this variety is not as pronounced as the 1916 variety, it is still very obvious on the last digit of the date. Look carefully for an underlying "7" under the last digit "8" in the date. Numismatic experts believe that the mint produced over 100,000 of these coins. A majority of them circulated before collectors could save them for their coin collections. Therefore, the uncirculated specimens are extremely rare. The United States Mint only produced Buffalo nickels at the Philadelphia and San Francisco mint facilities in 1921. Philadelphia produced a majority of the specimens with a mintage of over ten million coins while San Francisco only produced about 1,500,000 coins. This 7-to-1 ratio makes the San Francisco coin the rare of the two issues. Circulated specimens are easy to find, but you will pay a premium price for one of them. Uncirculated coins are even more rare and will cost a $1,000 and up! Slightly more affordable than the 1921-S issue is the 1924 San Francisco minted Buffalo nickel. Once again the Philadelphia mint produced a majority of the coins with a mintage that exceeded 21 million coins while Denver only produced slightly more than 5 million coins. The San Francisco mint made slightly less than 1.5 million coins. This 14-to-1 ratio makes this coin scarce and all grades. Rare in uncirculated grades has drive toe value of these coins to well over $2,000! In 1926, production at the San Francisco mint facility trailed far behind both the Philadelphia and Denver production numbers. Once again the Philadelphia mint produced a majority of the coins that year with a mintage of almost 45 million coins and Denver producing almost 6 million coins. San Francisco lagged significantly behind with only 970,000 coins. This low mintage number at San Francisco yields a high value for this scarce coin. The United States Mint in Philadelphia produced this die variety when a mistake was made during the manufacturing process of the coin die. This variety is recognized by strong doubling on the inscriptions FIVE CENTS, and E PLURIBUS UNUM. Additional doubling is evident on the bison's eye, horn and mane. This doubling is very strong and is cataloged as variety FS-05-1935-801. Do not mistake this coin for the weaker doubling as found on variety FS-05-1935-803. In 1937, a production worker at the Denver mint facility tried to repair a damaged reverse die only to make things worse. There was a die clash in the lower left corner of the die by the buffalo's right leg. As he used a tool to remove the indentation on the die, he removed so much metal that the detail from the buffalo's front leg was lost. Unfortunately, unscrupulous people will take a 1937-D Buffalo nickel with all four legs and remove the front leg. Expert numismatists can tell if a coin has been altered. Therefore, make sure you acquire a certified specimen or purchase one from a reputable coin dealer.